Some confusion with names. As best I can understand the green leafed form is Canna edulis and the red leafed form Canna indica. Both have bulbs and I have eaten C. edulis grated in soups, it's quite nice. Also the young bulbs can be roasted or chipped, though I have no experience cooking it this way. Easy to grow, plant a bulb in spring and keep it mulched and watered, it will be quite productive. Canna edulis is commonly called Arrowroot. The leaves and stems of C. edulis (green leaf, not red) which grow up to 2m are said to be a high protein stock and poultry food. Canna indica is also known as saka siri, Indian shot, canna, achira, bandera, chancle, coyol, platanillo, African arrowroot, canna, canna lily, edible canna, Indian canna, purple arrowroot, Queensland arrowroot, red canna, Sierra Leone arrowroot, tous-les-mois arrowroot, wild canna. The book 'Exotic Greens, a selection of Vietnamese herbs, vegetables, recipes and remedies from the Collingwood Community Gardens' says it can be boiled like potato or dried to make noodles. Canna indica is regarded as an environmental weed in New South Wales and south-eastern Queensland. It is mainly found north from Macquarie Pass in New South Wales, and is of particular concern in the Sydney, Blue Mountains, and North Coast regions. However, this garden escape is probably most common and invasive in south-eastern Queensland, where it appears on the list of the 200 most invasive weeds. It is considered an environmental weed because it forms large dense clumps, particularly along waterways, and replaces native aquatic and wetland species. It is also regarded as an invasive species in other parts of the world and is listed in the Global Invasive Species Database. In Hawaii and Fiji it also becomes naturalised in disturbed wetter forests and in forest clearings. This is a member of the bean family with all parts of the plant poisonous, apart from the edible tuber. Well worth growing, start seeds in pots in early October with artificial warmth and transplant late October. Should be quite suited to Melbourne’s climate. Plant tubers under mulch in September, they are very hardy, however for best results water them regularly. Can be used in soups or strews but I like them best baked. They seem to inhibit weeds. When the tops die off dig them up saving tubers from the best plants to plant for next years crop. When you have finished digging them, making sure you have got out as many of the small ones as possible smooth over the soil with a rake. You can replant next years crop the same day, give it a good water to germinate the weed seed exposed with the soil disturbance. A fortnight to three weeks later there should be a cover of young weeds growing. Very carefully plant either broad bean seed or peas with an absolute minimum of soil disturbance (poke a holes in the soil and drop the seeds in so as to create minimum disturbance). Cover the soil with mulch suffocating the young germinating weeds, the peas or broad beans will easily grow up through it, the artichokes following next spring. Also called Peruvian ground apple. One of the most exciting additions to the garden in recent years, grow them like Jerusalem artichokes but the raw tubers, which grow to the size of a sweet potato, taste like nashi pears. When you dig them up, eat the smooth yam like roots and save the Jerusalem artichoke like bits to grow next year. Some of the above should be available for purchase from the Collingwood Children’s Farm next spring, it's open 7 days with gardening folk in attendance for advice on Friday, Saturday and Sunday. Yacons are one of the most exciting recent additions to the variety of our food producing plants, producing a tuber available throughout late autumn and winter. Eaten raw, it tastes like a nashi pear and it can also be lightly stir fried. People have also juiced it. Yacons are quite hardy and grow to about a metre in height, they can be harvested from late autumn until the end of winter. Care should be taken when digging them up as the edible tubers can be quite brittle. The underground part has two distinct forms, sweet potato shaped yams and knobby bits that look a bit like Jerusalem artichokes. 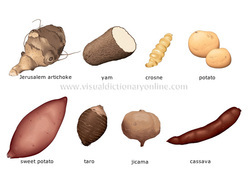 Eat the smooth yams and save the knobby bits (corms) to grow again, these can be divided to increase the number of plants or to be shared around. Once dug and divided, the corms don't seem to keep long so keep a few plants to the end of the season and don't divide up any of the ones dug earlier until you are ready to plant them. I like to wait until the corms are shooting before dividing and planting them. They respond to mulching well and seem to be good companions with Oca (Oxalis tuberosa), both can be harvested at the same time. Wait 2-3 weeks for weed germination then cover with a light to moderate layer of mulch to suffocate the germinated weeds. It is soil disturbance that causes the germination of weed seed, so if there is no more soil disturbance there should be very little weeding until harvest.